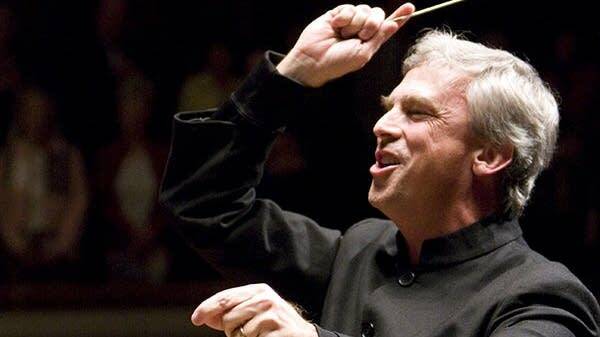 For 26 years, Jerry Junkin has served as the artistic director and conductor of the Dallas Winds. He's hailed as one of the premiere wind band directors of the day. "Quite frankly someone told me one time that the secret to being a really great conductor is to conduct really great musicians. I'm fortunate to be able to do that with the Dallas Winds, because they make my work easy and make me look much better than I am." Their latest recording together celebrates John Williams at the Movies. I didn't realize that John Williams loved writing, arranging, conducting and, well, performing wind band music. This was kind of revelatory and exciting to see. "They kind of came into being as a result of him revisiting his band roots a number of years ago and conducting a concert with the United States Marine Band and just falling in love with them and with the medium, and that has prompted many more new arrangements for the wind band." How did you decide what to put on this recording of all those movies and the arrangements available? "In this case, when there's so much material, the difficult thing is where to stop. And, in fact, we have plans to record a volume two coming up within the next year or so. But for this one we wanted to have some of the iconic pieces of his, so clearly the Star Wars: Main Title has to be on there. The Superman March, the Olympic Fanfare and Theme. All of these have become iconic pieces. "One of the collaborations I'm really proud of occurs on this CD and that's Christopher Martin's performance of With Malice Toward None from the film Lincoln, Christopher Martin being the principal trumpet of the New York Philharmonic. John Williams actually wrote this piece for him. He took it out of the score and made this version for solo trumpet. I'm actually quite pleased with how it turned out." There's another film that I had kind of forgotten about. It's the 1972 western with John Wayne, The Cowboys. "The piece is called The Cowboys Overture and there's not actually a Cowboys Overture in the movie. I think it was after the movie came out  if I'm remembering the story correctly, it was Andre Previn who told John Williams, 'You've got to turn this music into a stand-alone concert piece,' because it's just so thrilling and so remarkable. And over time he took that to heart and this is the result: The Cowboys Overture." And it was this score that caught the ear of Steven Spielberg, wasn't it? "That's right. Jaws was I think the first really attention-getting score of their collaboration, and then that led to all these other things. Excerpts from Close Encounters of the Third Kind is on this disc which you mentioned and then also of course The Adventures on Earth from E.T., which is one of the most thrilling pieces in all of movie music." Why do you think people are attracted to the wind band's sound? "When it is skillfully done, it's amazing, because you have this incredible palette of color with all of these woodwind and brass instruments, plus the amazing addition of whatever you want in percussion. And there's also this unique oddity is that wind bands almost always have a double bass, and you think, 'Well, that's got to be useless, why is there a double bass standing over there on the side of the band?' But, yet, you can always hear it. "Coupled then with the possibilities of harp, with piano, with organ  which we use on this recording and a couple of pieces  I think there's just this infinite color palette that really appeals to people."